Temperance - just what the doctor ordered! Small lodges face an array of challenges that larger lodges are less likely to encounter and greater pressures are placed on a limited membership. Absences due to illness, work commitments or personal family ties can dramatically compromise the manning of major ceremonies. Nevertheless, stoic dispositions of the remaining brethren, along with the generous cooperation and support of trusty regular visitors, can, and will, overcome all difficulties; though not without a few hiccups perhaps. Umesh Dholakia (left) is congratulated by David Walmsley. The historic Blackpool Temperance Lodge No 5303 exhibited just such resolve at its installation ceremony at Blackpool Masonic Hall. Assistant Provincial Grand Master David Walmsley was on hand to provide exhortation and encouragement to a vastly depleted team – and one which was experiencing more than its fair share of difficulties due to absences and less than perfect health. Accompanying David and also urging the team on were fellow grand officers; Chairman of Blackpool Group John Turpin, Stuart Thornber, Peter Bentham, David Thomas and honorary member of the lodge Geoffrey ‘Sticks’ Pritchard. High ranking Provincial officers were also plentiful, offering further encouragement to a diminished work force. Heading these was regular visitor to the lodge John Lee PPrSGW, Secretary of Blackpool Group Steve Jelly and the ubiquitous acting Provincial Grand Pursuivant Jim Finnegan. The first invalid for the offensive of the day was the principal protagonist, the installing master Martyn Jones. Martyn, who was awaiting hip-replacement surgery, was looking somewhat subdued and care-worn, as if his soul had passed through a shredder. Relying on his walking stick as his principal working tool, he wore the unmistakeable air of a man who wished for a more comfortable ride. Nevertheless, rising above his predicament, he put in a solid performance and found himself feeling that it was not such a bad little old world, after all. A few minor adjustments and modifications to the ceremony were necessary as a result of Martyn’s infirmity. In placing his successor into the chair of King Solomon, Martyn had to forego some of the trickier dance steps. This, of course, was all very well, as far as it went. After all, one cannot expect an installing master to take a tumble in order to simply amuse his audience, no matter how hilarious they might have found it. Whatever difficulties and amendments arose, the master elect Umesh Dholakia accepted with grace and consideration. But that’s the sort of chap Umesh is. Cool and unshakeable; the sort of bloke who would calmly shrug his shoulders at Armageddon. Umesh, who has been in the chair on two previous occasions, took everything in his stride. He is a pharmacist by vocation and brings the same calculated professionalism to his Masonry that he inevitably plies to his trade. Having being comfortably deposited in the chair, Umesh relished the remaining elements of the ceremony. Pictured from left to right, are: Martin Haines, Umesh Dholakia and John Haines. After the readmission of master Masons, lodge invalid number two hobbled to the designated spot to deliver the working tools of a master Mason. It was the first time that Brian Montgomery (or ‘Monty’ as he is more affectionately known) had experience of delivering ritual. Despite licking a severely injured and painful leg, Monty was determined to carry out his allotted task. Bracing himself mentally to face the demanding chore that lay before him, Monty sucked in a gasp of air and gulped it down as if to pray to a God of ritual for assistance. Well, it has often been catalogued that men can muster unsuspected qualities when faced with stressful and demanding roles. And it was in such a vital cause that Monty responded with grit and resolution. He stiffened the sinews and summoned up the blood. On completion of the ordeal, he sighed audibly, no doubt feeling like a man who had just dodged a charging bull. 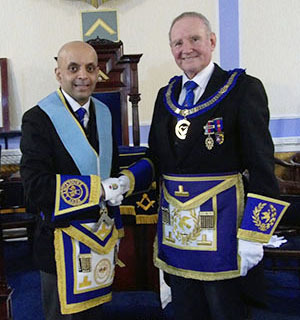 Stalwart of the lodge Sheldon Rawstrone, who was also receiving treatment for health issues and who had been called upon at very short notice to present the working tools of a fellow craft Freemason, was next to approach the master’s pedestal. 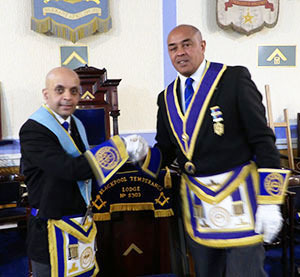 Sheldon, who celebrated his 50 years in Freemasonry in 2018, has established an unqualified reputation as both a Mason and ritualist. Although there was a momentary hesitation at the commencement of the piece, the hesitation was, of course, merely a temporary one. A moment later, Sheldon was himself again and he sailed through in classic style. The lodge’s most recent member, Tom Cunningham was next in the firing line. Tom had only attained the sublime degree of a master Mason the previous month and had volunteered to make his debut as a ritualist by reciting the working tools of an entered apprentice. This was the first occasion on which Tom had seen grand and Provincial grand officers in full dress regalia or attended a ceremony at which there were more than 25 Masons present. Little wonder then that, on such an occasion of pressure and intensity, a lesser man may have withered. But Tom is not a lesser man. He keeps his head under pressure. He thinks quickly and acts quickly. Horatio Nelson was much the same. Drawing a deep breath, he spouted the text in splendid fashion, gaining the approbation of the entire ensemble. Put to the test, he had proved a complete success. It was a masterly stroke. Martin Linton (right) congratulates his good friend Umesh Dholakia. 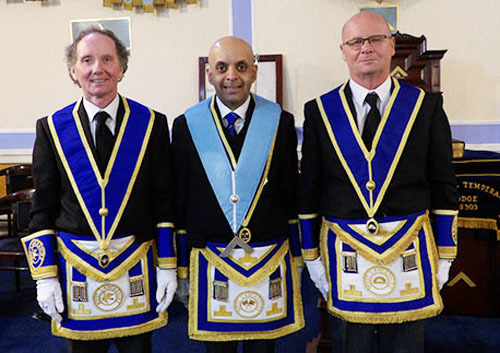 It was with similar quiet satisfaction that the lodge’s venerable director of ceremonies Martin Linton experienced when he transmitted the Hall Stone Jewel to the newly installed master with equal alacrity. The Hall Stone Jewel is a profoundly auspicious jewel that commemorates the 1,000s of Masons who sacrificed their lives during WWI and there is only a handful of lodges on the Fylde who have earned the privilege of the master of the lodge wearing it around his neck at all lodge meetings, be it at his home lodge or on visiting another. Giving credit where credit is due, one thing that can be said of Martin as a director of ceremonies is that he can plan a campaign. Field Marshal Erwin Rommel would have benefited from a training course with him. Follow his plan in detail, and there you are. Yet, if on the evening, things don’t go absolutely to plan, Martin readily manoeuvres and reassigns his troops accordingly. He is a master amongst directors of ceremonies. Demonstrating his own genius at ritual still further, Martin proceeded to recite the address to the newly installed master. In characteristic manner, he articulated with crystal clearness and a precise edge on his speech. It was beautifully modulated. It was after this juncture that visiting brethren rose spectacularly to the challenge. Installing senior warden Martin Haines and installing junior warden, his twin brother John Haines asserted themselves as masters of ritual in delivering the addresses to their germane recipients. They performed with unashamed brilliance and were a joy to experience. It was only a couple of ticks later that the multitude was again treated to another wonderful spectacle when Ryan Modlin blazoned forth with the address to the wardens. His intonation was as clear as a bell. His performance smacked of someone possessed by the soul of one of the great orators; Abraham Lincoln, Winston Churchill or Martin Luther King. That he did a superb job; you bet your Sunday cuff-links he did. His performance was full on with total conviction. Installing inner guard Barry Lee maintained the standard in his address to the newly invested inner guard. There are Masons who, when approaching to perform ritual, hesitate and quiver before starting, and then there are Masons who stride up unhesitant and bold. Barry was one of the latter; his boldness clearly demonstrated by the gusto of his delivery. There only remained the address to the brethren of the lodge by Assistant Provincial Grand Master David Walmsley. As expected, he delivered the piece in fine style; polished, if you see what I mean; eloquently, professionally, as a matter of fact, if it comes down to it. Revelry is at its height at the festive banquet. When the ceremony was all over, it was the cue for David to rise to his feet once more to convey warm greetings from the Provincial Grand Master Tony Harrison. Everyone who has attended an installation ceremony will be familiar with the customary complimentary words from the principal guest to those involved in the ceremony. On this occasion there was no exception. David was full of praise for the team and, let’s face it, he was in the perfect spot to make a judgement; he had occupied a ring-side seat throughout the challenge. At these closing remarks, installing master Martyn Jones perked up considerably. He wasn’t actually squaring his shoulders and sticking his chest out but the morale had plainly stiffened and he was becoming almost jaunty. If David hadn’t already been impressed with the lodge, he was about to have his socks blown off when Umesh presented him with the details of the lodge’s charitable disbursements. For such a small lodge to have raised £2,800 for worthy causes was ‘remarkable to say the least’. David was particularly delighted to receive a cheque for £2,000 to the Masonic Charitable Foundation 2021 Festival. Additional donations of £450, £250 and £100 went to Trinity Hospice, Blackpool Masonic Club and Blackpool Museum of Freemasonry respectively. Founded during a resurgence of the British Temperance Movement in the 1920s and 1930s, Blackpool Temperance Lodge remained faithful to its principles for many decades, insisting on abstinence from alcohol consumption at lodge meetings and social functions. Jugs of orange juice, water and such were provided to the revellers for refreshment during meals. Later in its history, the rigidity of the rules were relaxed or circumvented. Ladies’ evenings and other social functions were organised in conjunction with non-temperance lodges, thereby relinquishing the shame of providing an alcoholic bar to the other lodge – clever move! Historically then, visiting brethren have played a vital role in the continuance of Blackpool Temperance Lodge. And that is a tradition that now appears to be set in stone. It is a lodge that regularly receives large contingents of visiting brethren. After the installation ceremony was all over, when happy endings had been circulated in heaping handfuls, when the throng had shimmied off to the festive banquet and David had apprised the brethren of pressing bulletins from Provincial Grand Lodge, the gathered horde were treated to informal jocularity and spontaneous banter and the revelry began in earnest. Blackpool Temperance Lodge is a small lodge and is presently disadvantaged by its fair share of health issues. Little wonder then that the lodge has turned to pharmacist Umesh Dholakia to take the helm. There could not have been a better or more appropriate choice – exactly what the doctor ordered for Blackpool Temperance Lodge. We’ll all drink to that. Oops! Sorry! That’s against lodge rules. Pictured from left to right, are: Steve Jelly, Geoffrey Pritchard, Stuart Thornber, Umesh Dholakia, David Walmsley, John Turpin, David Thomas and Jim Finnegan.